Stair riser tiles really let your personality stand out in a way that other tile projects can't match. Your home doesn't have to be a Spanish Colonial to enjoy this additional decorative touch. There are stair riser tile ideas for any type of home, whether your luxury home is a modern marvel or an earthy green home. And, if your home does happen to hark back to more vintage times, you can also use traditional tiles in new ways to get a newer look. Here is a list of 7 amazing stair riser project ideas to get your creative juices flowing. Before we veer off into newer territory, let's take a look a how a trusty traditional design can be upgraded with stone tiles, instead of ceramic. Newer cutting techniques allow stone tiles to have some of the same intricate designs as ceramic tiles, but with a more high-end look and feel since they can be etched. 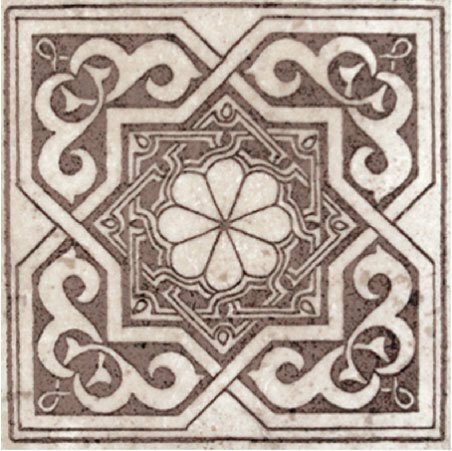 Just imagine using this etched stone Lalma tile in your Spanish Colonial stair riser tile project. Or, if you prefer a softer brown, you can go with the Vulcan etched stone tile. Did you like the newer traditional tile options? Why not consider using them in a two-step approach where you can alternate decorative with solid tiles for more variety. 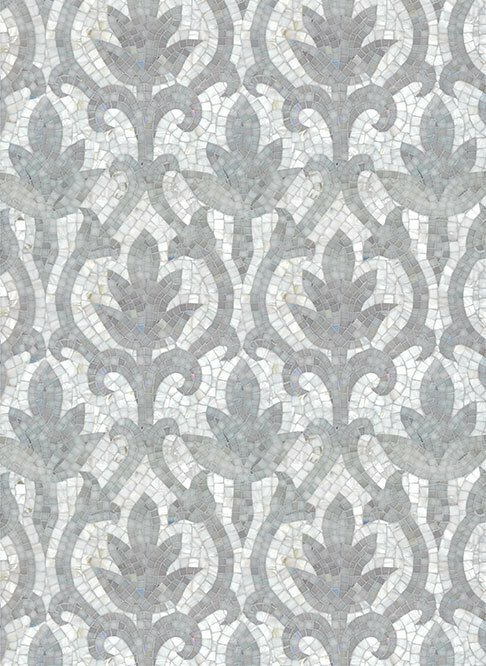 For instance, you can combine this beautiful waterjet cut Adimas tile with beige, gold, or even blue solid tiles to create an entirely new design with traditional motifs. This mix-and-match approach opens up a wide palette of possibilities. 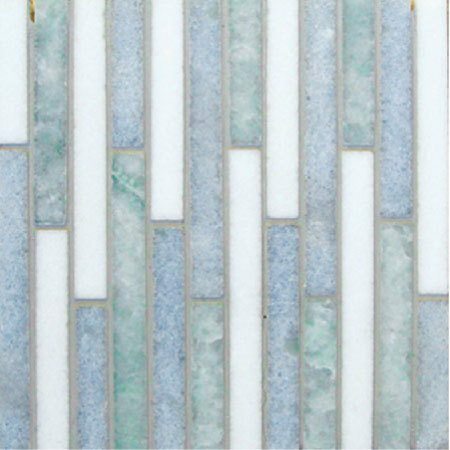 For instance, the conventional approach to using a stick mosaic on a riser, like this Soho Splendor stone tile, would be to use it one after the other, either laid horizontally or vertically to create a consistent modern piece. 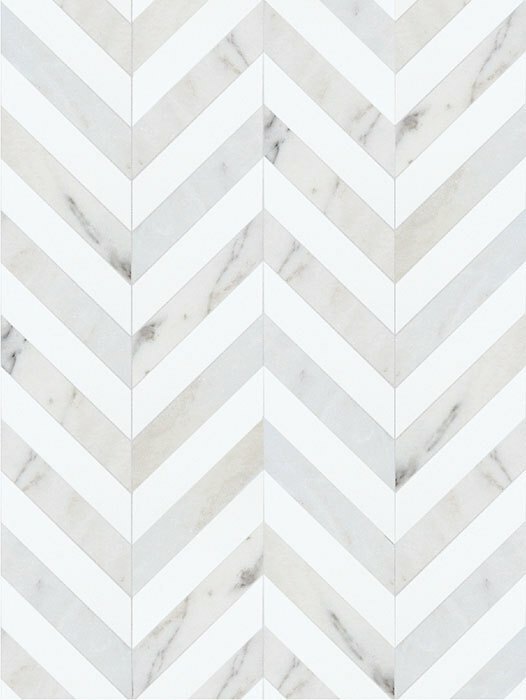 However, if you wanted to two-step it, you could just alternate them with a Chevron tile in white, like this Adore tile, or simply use a plain white tile. The design possibilities are really only limited by your imagination. Who says you have to use the tiles in squares? 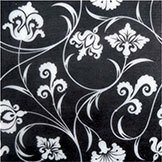 Custom tile layers can cut the tiles on-the-job to create even more spectacular designs. Cut the tile in fourths on the diagonal and them lay some squares at a 45 degree angle, and you can gain a whole new perspective in design! Combine this new layout format with two different alternating tiles and even if you use a traditional Meditteranean tile, it still looks fresh and inviting. Border tiles aren't just for bathroom and kitchen backsplashes. They can completely transform a stair riser and give it a dimensional effect at the same time. It does depend on the height of your riser, but you can fill in the gaps with other cut pieces. 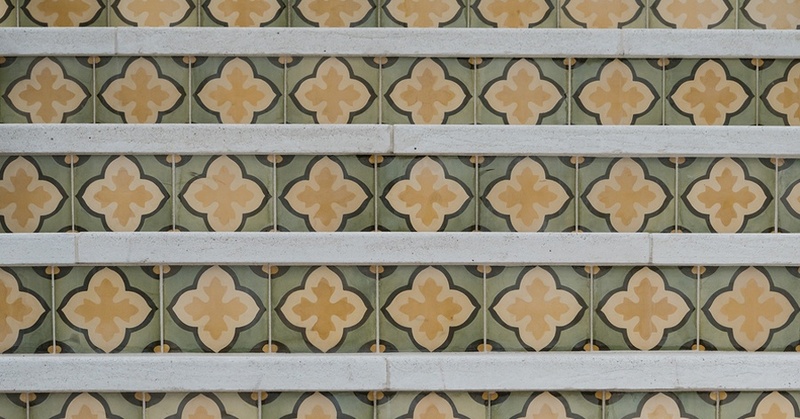 Take a look at this stunning example of a border tile being used as a stair riser to get the idea. Notice how the top border lines up and accentuates each riser in a way that patterned tile misses and the scrollwork on each riser echoes the wrought iron scrolled guard rail. It's a work of art on many levels! Interested in something more contemporary and modern? Using newer materials like glass, mica, mother-of-pearl, and even mirrored tiles, you can create a glittery crescendo that surpasses just the use of color and design alone. This type of tile is particularly effective in areas where it can catch sunlight during different parts of the day. 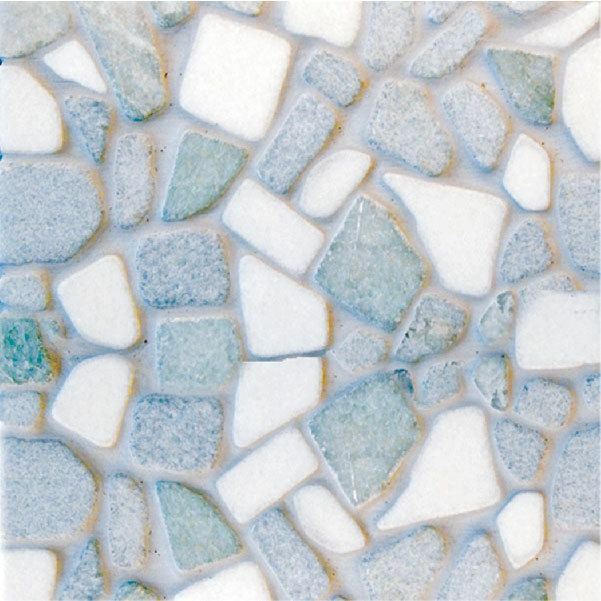 Consider using a Muna mother-of-pearl and stone tile or an Uxma tile for a more modern look. To get a softer light effect, go for glass tiles, in different colors, whether the tiles are matte finish or not. If you've ever turned the corner on a house only to spot a stone mural, you'll know how effective it is at creating a good impression. Now, consider that a wall or a floor is not the only place you can put a mural. Stairways are actually the perfect spot for a surprise mural because no one expects it there. Instead of being one whole piece, the mural is split up into horizontal sections with each stair riser. That means you can see the entire design upon approaching the staircase only, which is why it's such a unique piece. 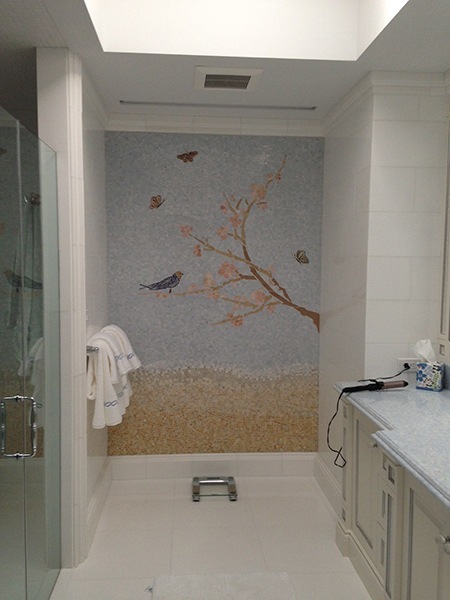 Imagine this cherry blossom tree mosaic mural climbing up your staircase instead of hiding out in your bathroom. Murals are perfect for delighting and amusing the guests in your home, so make sure it is as highly visible as possible by putting it on your staircase risers. What if you live in a sustainable green home with an emphasis on natural materials? If you want to make sure everyone knows what your values are there's no reason you can't add a little more of that natural look and feel to your stair riser by using pebbled tiles. 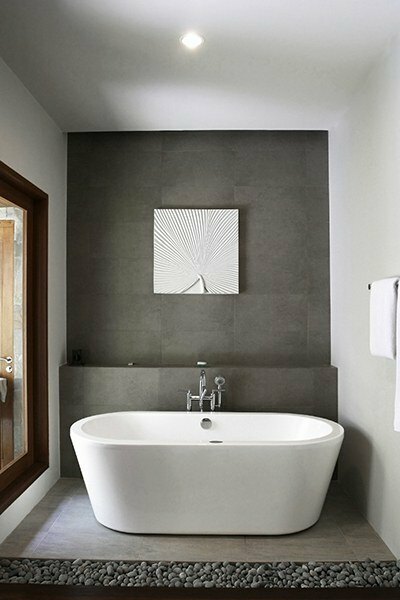 Take a look at the riser on this bathtub surround to get an idea of what it might look like. It provides a dimensional, but natural, look that is stunningly appropriate in a green home. There are pleny of stone tiles that mimic pebbled walkways and come in a variety of different colors too, like this Larch tile. 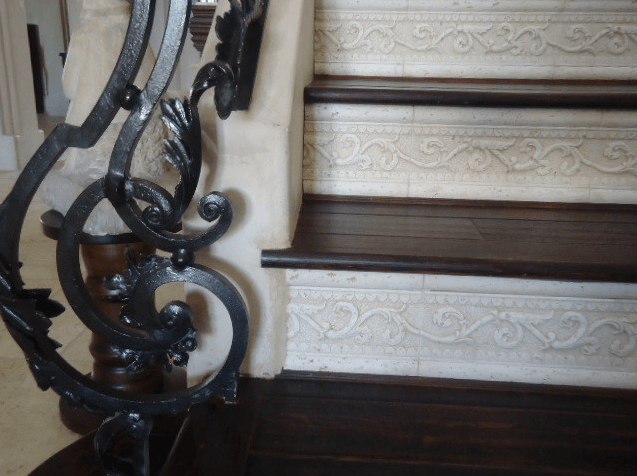 Stair risers are one of those fun home remodeling projects that seem trivial, but they actually can dramatically transform an entryway and make an instant design statement about your luxury home or business. While traditional square tiles on a riser are still a good option, if you want to increase the star power you can choose a different layout pattern or consider new, exciting, materials. 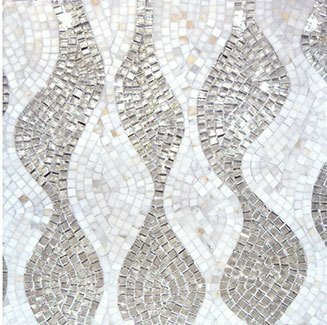 Finally, if you really want to make a powerful statement, you can create a mosaic masterpiece that is a whole work of art created from each single riser. Do you think you would incorporate some of these stair riser tile ideas into your home? If you have any questions about an idea you might want to try on your next stair riser design project, just comment below.